WORCESTER, MA – The Worcester Railers Hockey Club (@RailersHC), proud ECHL (@ECHL) affiliate of the New York Islanders (@NYIslanders), and Railers HC General Manager and Head Coach Jamie Russell (@JamieRussell18) officially announced today that the club has signed forward Tyler Barnes to anECHL contract for the 2018-19 season. 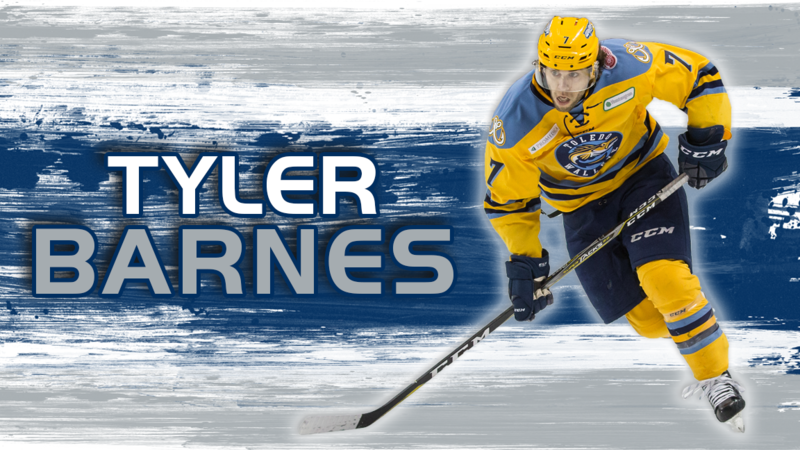 Entering his fifth professional season, Tyler Barnes joins the Worcester Railers HC after leading Toledo in points last year (20-33-53). The six-foot, 194lb Burnsville, MN native has spent four seasons in the ECHL playing with four teams including the Missouri Mavericks, Indy Fuel, Allen Americans, and Toledo Walleye for a total of 232 games, in which he compiled 89 goals and 126 assists for 215 total points. In the 2014-15 season, Barnes made the ECHL All-Rookie Team, appeared in the ECHL All-Star game, recorded the most points (74) in the ECHL as a rookie, and was awarded Rookie of the Year. Barnes has also spent time in the AHL appearing in games for the San Antonio Rampage, Grand Rapids Griffins, Bridgeport Sound Tigers, Rockford Ice Hogs, and Cleveland Monsters, recording eight goals and three assists for 11 points in 37 games. In addition, the Worcester Railers have traded defenseman Ben Masella to the Florida Everblades for future considerations. Barnes joins Barry Almeida, Woody Hudson, Tommy Kelley, Kyle McKenzie, Connor Doherty, Tommy Panico, Malcolm Gould, Dylan Willick, and Nick Sorkin in signing an ECHL contract with the Railers for the 2018-19 season.